Roie-immeeaght: Henry Cabot Lodge, Jr.
Va John Fitzgerald "Jack" Kennedy ny JFK (29 Boaldyn, 1917 - 22 Sauin, 1963) ny 35oo Eaghtyrane ny Steatyn Unnaneysit veih 1953 derrey yn dunverys echey 'sy vlein 1963 ayns Dallas Texas. 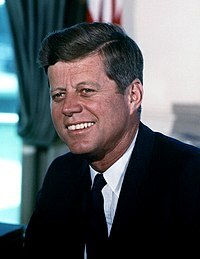 Ta tooilley coadanyn mychione John F. Kennedy ry-gheddyn ayns Wikimedia Commons. Hie yn duillag shoh er ny reaghey er 31 Jerrey Geuree 2016, ec 18:22.